Epilepsy patients who sleep on stomach face sudden death risk similar to SIDS (sudden infant death risk), according to research. Study author Dr. James Tao said, “Sudden unexpected death is the main cause of death in uncontrolled epilepsy and usually occurs unwitnessed during sleep.” Among epileptics, the risk of death while asleep is highest among patients with tonic clonic seizures. The researchers reviewed 25 studies, which included 253 sudden deaths. Body position during sleep was recorded. 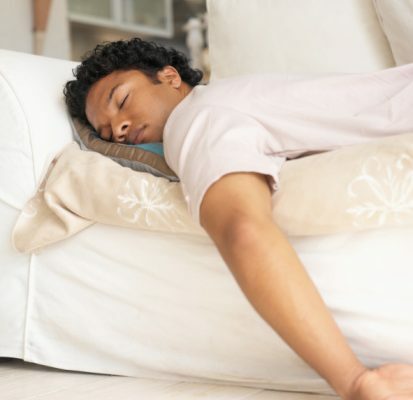 The researchers found that 73 percent of sudden deaths occurred in individuals sleeping on their stomach, and the remaining 27 percent accounted for other sleep positions. Looking at a subgroup of 88 study subjects, the researchers found that individuals under 40 were four times more likely to sleep on their stomachs at the time of sudden death. “Similar to infant SIDS cases, adults often have an impaired ability to wake up after a seizure, especially a general seizure. Our findings highlight an important strategy for preventing sudden unexpected death in epilepsy — that ‘back is best’. Using wrist watches and bed alarms designed to detect seizures during sleep may also help prevent these deaths,” Tao concluded. The researchers found that children who were deemed neurologically normal but had strong breathing modulations (similar to those seen in epileptic children) and low heart rates were later diagnosed with epilepsy. The researchers looked at 91 children and adolescents with generalized epilepsy and 25 neurologically normal children during 30 minutes of light sleep. The researchers uncovered that respiratory sinus arrhythmia – the increase in heart rate when breathing in and decrease when breathing out – was more pronounced in epileptics, and that their heart rate also was significantly lower. There was also no difference in blood pressure between the two groups of children, which indicates that the part of the nervous system responsible for fight-or-flight response was not involved. The researchers discuss the possibility of using medications to control the autonomic nervous system as a means of treating epilepsy. Adult treatment for epilepsy involves the implantation of an electrode to stimulate the vagus nerve, which stimulates the brain. Galán cautions that this method should not yet be used on children despite his findings.